Spring has arrived, and it’s time to welcome the new season by freshening up your home decor. A few fresh pieces can make all the difference when it comes to brightening up your apartment, and it doesn’t have to break the bank! Read on for tips on how to incorporate spring decor this year. Bouquets of fresh flowers are an inexpensive way to infuse color and life into your apartment. If you take care of them by changing the water often and removing wilted leaves, they can last up to a couple weeks, depending on the type of flower. Another great way to bring the outside in is by adding greenery. Whether you have a sunny window that houseplants will love, or you’d rather stick to maintenance-free faux plants, using greenery in your decor can provide unique textures and organic lines to your home. Choose a heartleaf philodendron or some trendy succulents to add foliage to your space. Some of the spring decor changes you can make are not only stylish but also practical. While you’ve probably been reaching for heavy, chunky throws all winter, come spring, a lighter-knit blanket will look ideal dressing up the sofa. Choose one in a neutral or spring-like color to really change up your home for the season. In addition to the visual changes you can make, amazing scents can transform a space. Pull out your favorite candle or shop for some hand soaps to treat guests and yourself! Gravitate to scents like lemon, lavender, jasmine, and rose when choosing your candle or soaps. Mixing up your apartment decor for the season doesn’t have to break the bank. Switching out pillow covers is a quick, affordable way to give your living room or bedroom a mini makeover. Think flowery prints, lighter colors, and cheery designs to find a combination that pops! 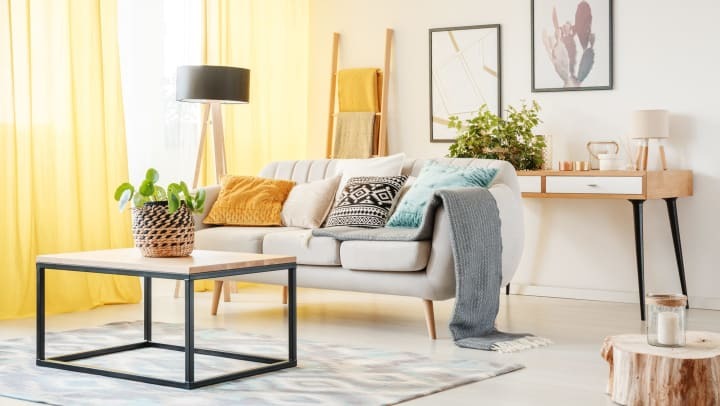 Whether you want to tuck away some clutter or go full Marie Kondo on your apartment, tidying up can change your space in a heartbeat. And it’s free! Toss what you’re ready to part with, and make your home feel fresh again. Art can make a big impact on the vibe of your space. If your pictures and frames seem dark and wintry, hit up your local thrift shops to repurpose used frames or find new art that matches the season. With the weather warming up, welcome spring by giving your patio or balcony at Alta Citizen a little TLC. Sweep up, brainstorm some creative storage ideas, and purchase some pieces that will beckon you outside. Adding an outdoor chair, a rug, twinkle lights, and potted plants can go the distance to make your patio or balcony spring-ready. What we consider crafting doesn’t have to be crazy hard. Order a soap dispenser top for a mason jar to add a spring feel to your kitchen, or tie back your curtains with ribbon in a spring pattern or color to let in more natural light and mix up your space. So much more than evergreen and pine cones, wreaths are the perfect, affordable seasonal decor item that welcomes your guests at the front door. Make your own with faux blossoms, twigs, or light green leaves, or pick one up. A wreath is the ideal spring addition to your space. Ready for more decor and lifestyle tips? Check out our blog.